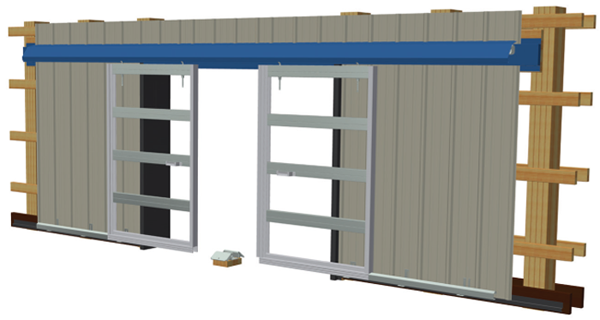 Complete the entire CannonBall door installation with track, trolleys, and sliding door system components. Available in a wide range of standard and custom sizes. Use with (20 GA.) Box Girt and/or (20GA.) AG-Girts. A cost efficient solution for large door requirements. All trim and flashing are durable, chip resistant finish, and ready to assemble and skin. All aluminum verticals side rails and bottom rails come standard in white. Our most popular framing system, 200 Series rails are ideal for most sliding door applications. For larger sliding doors and doors in high wind areas, our 300 Series Bigg Frame system includes side rails, double couple and bottom rails for doors up to 20′ high and 20′ wide. A weatherstrip system is available.